“If my daddy didn’t have a BMT he would never have known me, and I would never have known him”. On 26 June 2007, my husband, Mark, was diagnosed with acute myeloid leukaemia (AML), he was 37 years old and we had a 6 and half month old baby girl and a 6 year old boy. Within days of being diagnosed, Mark was admitted to M2 Cancer Care, Gosford Hospital, and received lifesaving chemotherapy. However after three months it was evident that Mark would need a bone marrow transplant (BMT) to save his life. Mark had a great deal working against him, and had less than a 10% chance of finding a donor worldwide. In December 2007, we were called to St Vincent’s Hospital, Sydney, and told a donor had been found. We were told to possibly prepare for a year in hospital. 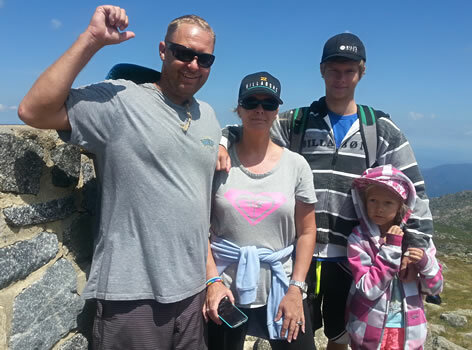 Our doctor said to go on our intended holiday, enjoy our family time, get our affairs in order; and told Mark to surf as much as possible to get strong for the transplant. We had a fantastic summer, but also knew that Mark’s life depended on the success of the transplant in April 2008. In late March, we received a call nine days before the transplant, informing us that Mark’s AML had returned. Things were not looking great. The team at Vincent’s decided to go ahead with the transplant, and on the 13th of April, 2008, Mark received his life saving bone marrow transplant. After six weeks in hospital and very few complications his was back at home. Mark’s donor came from New York, he was a 34 year old male who we will never know. What an amazing gift to give another person. Without the research funded by the Arrow Bone Marrow Transplant Foundation and the amazing doctors and nurses involved in cancer care, Mark may never have survived. Mark is extremely lucky as many transplants are unsuccessful due to complications or rejection. At the same time that Mark had his transplant, two other beautiful people passed away from complications. They were 37 and 50 years old. I have decided to raise funds for cancer research and Arrow, whose support of vital research will allow others to grow old, to see their children grow up and teach them to surf! To spend many more years with partners, brothers, sisters, parents and friends; and to help those diagnosed with blood cancers and disorders for which a transplant is the only option for survival. We are so lucky to have had the wonderful outcome we have and are forever grateful to the amazing medical professionals and medical researchers that helped save Mark’s life. I would like to share a quote from our eight year old daughter to myself and a beautiful cancer care nurse of few weeks ago: “if my daddy didn’t have a BMT he would never have known me and I would never have known him”.